The martial enthusiasm that engulfed the North when the American Civil War commenced in April 1861 vanished by the following summer. Repeated military defeats, economic worries, and staggering casualties prompted many civilians to question the war’s viability. Frustration exploded into anger when Republican president Abraham Lincoln issued his preliminary Emancipation Proclamation in September. The disgruntled voices grew louder. These anti-Lincoln Democrats, nicknamed “Copperheads,” viewed blacks with disdain and considered many of Lincoln’s legal decisions to be unconstitutional. Civilian disenchantment led to significant Republican defeats in the November Congressional elections. As 1862 ended, Northern morale was at rock bottom. Across the North, ardent pro-Lincoln men realized their country needed a patriotic stimulus, as well as an organized means of countering what they viewed as their Copperhead adversaries’ treasonous pronouncements and subversion. These men formed what became known as Union Leagues: semisecretive societies whose members had to possess unconditional loyalty to the Lincoln administration and unwavering support for all of its efforts to suppress the rebellion. Their mysterious member initiation rites were likened to a solemn religious ceremony. In “The Most Complete Political Machine Ever Known,” Paul Taylor examines the Union League movement. Often portrayed as a mere footnote to the Civil War, the Union League’s influence on the Northern home front was far more important and consequential than previously considered. 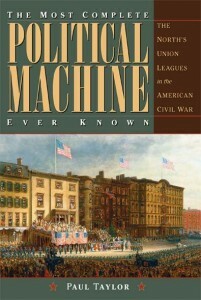 The Union League and its various offshoots spread rapidly across the North, and in this first comprehensive examination of the leagues, Taylor discusses what made them so effective, including their recruitment strategies, their use of ostracism as a way of stifling dissent, and their distribution of political propaganda in quantities unlike anything previously imagined. By the end of 1863, readers learn, it seemed as if every hamlet from Maine to California had formed its own league chapter, collectively overwhelming their Democratic foe in the 1864 presidential election. Author Paul Taylor is the author of six previous books pertaining to the American Civil War. His award-winning works include “Old Slow Town”: Detroit during the Civil War (2013) and Orlando M. Poe: Civil War General and Great Lakes Engineer (Kent State University Press, 2008). Author Paul Taylor speaks about his new book The Most Complete Political Machine Ever Known on the web show A House Divided.